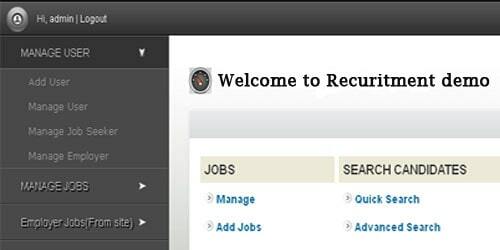 Manage Job Seeker: In this section admin can view jobseeker (candidate) details or can remove also. Manage Employer: In this section admin can view employer details or can remove. Post Jobs: In this section admin or employee can post a job by filling all the required details. Manage Jobs: In this section admin or employee can view edit or delete the posted jobs. Applied Jobs: In this section applicant who applied for the posted job can be view. Manage Drafts(Templates): In this section admin or applicant can save job description and can use this as a draft when posting this job. Employer Jobs(From Site):In this section admin or employee can view or delete the jobs that are posted by an employer from the website. Approval Queue: The jobs posted by the employer from the website has to be approved by admin. My Folders: In this section the shortlist candidate can be a list in a folder. Admin or employee can make many folders according to their need. Shared Folders: The folders can be shared in between other users. Quick Search: In this section admin or employee can make a search of the desired candidate by filling the desired option. Profile: The user can view or edit his/her profile. Mail settings: The user can view or change his/her email id. Dashboard: In this section, the user can check the status of the profile viewed by him and viewed by others.